Most kids love shells. I know Noah thinks they are the coolest thing ever. He loves going on mud walks with my mom and finding shells anywhere he can. We have a million of them. My mom has been collecting them for years and years. We went to the Saint Petersburg Shell Show today, it was a lot of fun and they had an absolutely brilliant craft idea that I had to share with you guys. 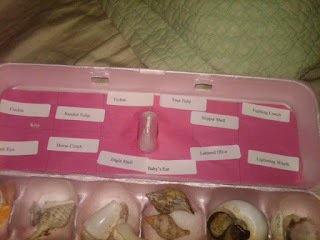 Most kids don’t really know the difference between the different shells. There are hundreds maybe thousands of different types of shells. Instead of gluing shell bits on paper, or whatever easy craft they could have provided for kids, they decided to do something different. They obviously put a lot of time and work in to the craft provided. They also offered a couple coloring sheets for those who weren’t interested in the main craft, but Noah was thrilled. He was so excited, it was so cool to see how shell smart he is. This craft would be perfect for kids that just got home from the beach with a bunch of shells. 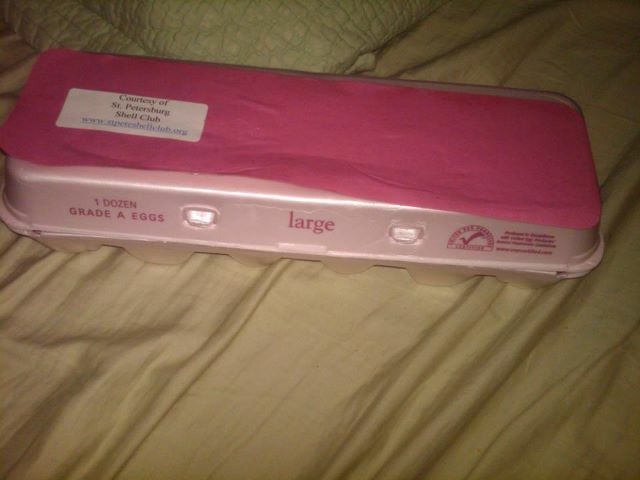 Cut out two shapes that will fit the outside and inside lid of the egg carton, make sure you cut a hole for the ridge of the inside of the egg carton lid. On the piece of paper with the hole draw 12 boxes. Glue the pieces of construction paper to the top of the lid and the inside of the lid. Write the name of the shell on the label and put it in the corresponding hole. Place the label on the inside lid of the egg carton and Voila you have your very own shell collection. How cool is that? Noah loved it. I am sure if you have a shell you can’t identify you can email me and Noah and I can figure it out for you. A special thanks to the St. Pete Shell Club for sharing this craft idea with us, and of course making my son’s week for loving shells as much as he does. This is a cute idea! We collect shells and this is just a cool idea! My kids also think that shells are the best thing ever! This is really cool! I am always collecting shells from the different beaches I visit, I'd love to know all of their names! This is an awesome idea! 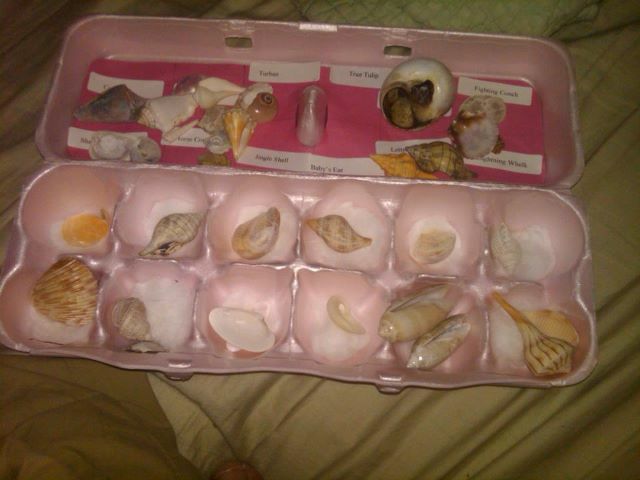 My siblings love collecting shells and this would be perfect. And so easy!